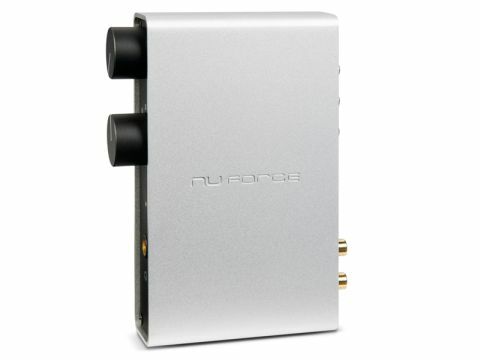 The NuForce Icon HDP is more than just a DAC. It's also a Class-A headphone and preamp. Furthermore, NuForce claims it leads the field in all three disciplines. These are bold claims, indeed – especially as the Icon faces the likes of Cambridge Audio's budget classic the DacMagic on the high street – but the spec of this everyman DAC certainly stands it in good stead. The DAC offers 192kHz/24-bit resolution via coaxial input only. Optical and USB inputs are also supported up to 96kHz/24. The optical input is via mini-jack, though a converter is supplied. Although the Class-A headphone amp is seen as something of a bonus here, it's a high-quality design in its own right and appears much better engineered than your average amp or PC headphone socket. Analogue in and outputs are available via RCA phono with the headphone socket automatically muting the line out. Both headphones and line out are controlled by the volume control. Disappointingly, no fixed line level output is available – this is desirable for a 'cleaner' signal path. Designed to be used vertically or horizontally, a neat silicon stand is included for the former. Given the price the Icon HDP is exceptionally well finished. Externally, the extruded aluminium sleeve, etched with the company's name, is both smart and solid. Only a lack of stick-on feet, for when used horizontally, mark it down. Internally, the tiny dimensions have instigated the need for some clever packaging. The DAC board sits above the main PCB and features a separately regulated power supply. All switches and sockets, including the ALPS volume pot, are of good quality with all connections being gold-plated. The inline power supply, with kettle lead connection, is a standard device and would no doubt benefit from upgrade from one of the 'tweakers'. Along with the DacMagic, the HDP is amongst the best-sounding DACs below £350. In terms of dynamic reach and depth of bass, there's simply nothing to touch it at this price. With Daft Punk's Aerodynamic, the HDP thundered through the track with a strong, driving bass and soaring guitar. Yet, the excitement doesn't come at the expense of refinement. Although slightly forward sounding, the HDP always remains agile and well balanced. Classical music reveals precise cymbal decay, suitably rasping brass, a fine string timbre and the dynamic scale to do justice to large orchestral pieces. Female vocalists aren't formed quite as accurately as some, mostly more expensive, DACs but there can be no criticism of the emotional grip and presence of sound. That is to say, the HDP always sounds believable. One important question remains, however: how does this plucky Icon compare with its main rival, Cambridge's DacMagic? Against the DacMagic, the Icon HDP is more dynamic with increased bass depth and a more enveloping sound. In terms of timing, both are excellent. Where the Cambridge does have a slight advantage is in vocal articulation. It also has a digital output, adjustable filters and balanced XLR analogue outputs, all missing from the NuForce. Then again, it doesn't have a headphone socket or preamp capability. The choice comes down to this: if you're a consistent headphone user, the Icon wins hands down, but if you only need a DAC and prefer a more restrained sound, the DacMagic is better value. That said, the Icon's headphone amp sounds similarly powerful and full-bodied if not quite as lucid as, for example, the £280 Creek OBH-21SE. However, for definition, depth and sound staging, it's miles ahead of any built-in design and plenty of sub-£200 standalone models. As a DAC, the enveloping sound stage, dynamic clout and excellent separation ensure the HDP is up with the best. Dedicated DACs do little better. The similarly involving headphone amp and pre-amp are simply the icing on the cake. As desktop PC audio goes, this is as good as it gets.